Kelpie has started heading east towards the Mediterranean and has crossed the London meridian line. He is tucked into the corner of a large brand new purpose built aire in the UNESCO World Heritage town of Moissac, France (44.09791, 1.09284). Alan had done some research on Google maps to see where exactly the aire at Moissac was situated and what the roads into it were like. It turned out a new aire had been opened recently just down the road from the old one – so we headed off to see what it was like. Our satnav had different ideas though, again turning us down narrow streets with sharp turns instead of taking us what should have been the more straightforward route. We arrived at new aire about 16.00. It has a gated entrance with automatic payment by credit card. €12 for two nights including electricity and services. Space for 43 vans on the site on hard standing gravel pitches. An absolute bargain in a must visit town. 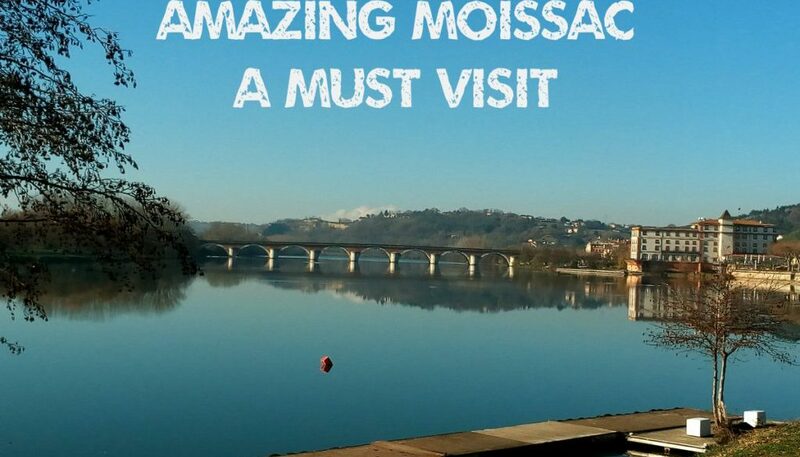 Moissac is situated at the confluence of the rivers Tarn & Garonne and also along the route of the Canal de Garonne. The new aire is situated on a thin slice of land that lies between the canal and the river Tarn. A back gate opens right onto the canal with a short 10 minute walk into Moissac town. We saw this very old 4 wheel drive overlander parked on the banks of the canal – old military vehicle? You can also go through the front gates and walk along the banks of the river towards the Napoleon Bridge and into town. The Moulin hotel sits on the banks of the river and the old aire was located outside the hotel, but had no services. Moissac is much bigger and a lot busier than the villages we’ve visited so far, but still retains the old fashioned French charm with lots of old wooden doors and window shutters everywhere you look..
Their claim to fame is the incredible 7th Century Saint Pierre Abbey in the centre of the town. The Abbey has been designated a UNESCO World Heritage Site and as part of the Routes of Santiago de Compostela in France. It looks pretty impressive from the outside with intricately carved stonework and pillars all around the huge south portal. Inside though is incredible. The huge solid wood doors of the impressive south portal swung open and revealed the most amazing scene – hand painted murals, hand carved pews and pulpits, the most beautiful place I’ve ever seen. It is also the quietest place I’ve ever been in my life – a whole different level of silence. The atmosphere was filled with centuries of quiet contemplation. I was completely bowled over by the whole experience and found myself just sitting, being in the moment, with my own thoughts. I can fully understand how much peace people get from just being in a place like that – I could have sat for hours. We got some fabulous pics but they don’t convey the calm that blanketed the whole building. This calm though had been shattered in 1793 after the French Revolution. Moissac had been ruled by the monastery and the people were not going to allow this to happen after the revolution. The Abbey was ravaged and the power of the Church diminished. The power struggle between the Church and the new republic state continued into the mid 19th century when it was decided that the a new rail network was more important than the Abbey grounds and they were cut in two with the new railway line to Moissac slicing its way through the middle of the abbey grounds. Symbols of this power struggle between Church and State are still evident today with the dual naming of streets with their old monastic names and new republican state names. The motto of the Republic was even carved into the stone walls of the parish church as a reminder of changed times. Liberté, Egalité, Fraterinité. Back outside in the bright sunlight we browsed around and spotted a place we might have coffee sitting in the shade of the Abbey – the feeling of peace and tranquility was shattered with a stone -cold cup of coffee which we paid €6 for – did we complain – of course not – we’re British – the British don’t complain – they just smile and get on with it lol. Not a bad backdrop for a cup of cold coffee! On a more mundane note we had to empty the toilet cassette – AGAIN. We emptied it before we left the last site and again at Moissac – We’re definitely doing something wrong – surely two people can’t produce that much crap in 24 hours! Yes thank you – no rollicking from the cheap seats at the back. Really getting used to being away and the sense of freedom to just please ourselves is amazing. Missing the family of course and in particular Jack but definitely not missing the life. Just sitting with the van door open and the sun shining in – in the middle of December – love it! Alan is trying to fix what appears to be a leak in the shower tray then we headed off to Puylaurens which was an old campsite that had been taken over by the council and turned into an aire (43.56853, 2.01209). Services were available but we only stayed overnight before heading on to Gruissan – looks like we might get to Spain by Sunday (but don’t hold me to it). If ever going to Spain I think we might follow your route. You really pick nice places, all new to us! Thanks for this blog! As for toilet: we carry an extra one with us. Surely you can put one somewhere, you have a huge moho! Thanks for the kind comments. Most people travelling to Spain will take the route down the west coast of France and into Spain at San Sebastian, but we had decided that we wanted to enter at the Mediterranean. We plotted a suitable route through France as we went along. We had never heard of these places before either and they didn’t appear in any of our guide books so they were a complete unknown until we arrived and had a look around. I think we have struck lucky in our choice of stopovers. We had considered an extra cassette, but never having spent as much as one night in a motorhome before we packed up to leave our house, we had no experience of how the cassette would last. It is a large cassette but I think it is my constant drinking of tea which is the problem! We will definitely be looking out for a spare now.